It has been quite some time since I have made a blog post! I have been sticking to putting my ideas on Goodreads because truthfully it was easier. The years 2017 and 2018 were very difficult for me personally so anything that made my life less demanding was the better option. Unfortunately, that meant using my brain because that can, at times, be a challenge in itself. Don’t let me stand alone in saying that people! 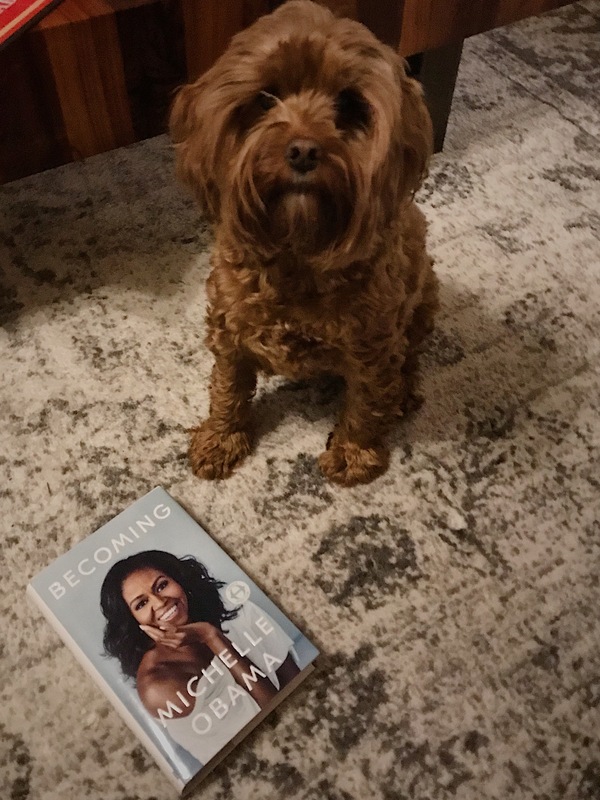 With that being declared, I am happy to have picked up Michelle Obama’s memoir, “Becoming” at where I am now. Life is not any easier and I imagine it won’t be for quite some time after suffering such a painful loss in my life, but I am at a point emotionally where I would like to read the words of someone that leans toward optimism. She is also my favorite type of glass half full type of person because it does not come naturally for her. She had/has to work at it. I think being around her husband and his relentless hope and faith for the country also rubbed off on her after time. Surprisingly, he isn’t the main focus of this story. I give this book 5 stars because for me, it was exactly what the doctor ordered. I needed to read this book during the holidays and the beginning of a new year when I felt anything but hopeful for a fresh beginning. This memoir is a look into someone’s life that tries really hard to be the best but realizes that life doesn’t always work out the way you want it to despite the effort. This can be seen for the reader when Michelle’s friend passes away from cancer, her own prideful father constantly ignores his MS disease, and the teen shootings that she was too close to comfort for. All the while, Mrs. Obama is asking herself, “am I doing enough?” If POTUS is asking herself that than I know for a fact the human brain and ego can play tricks on anyone to the value they hold. I say with dismay that I know absolutely nothing about politics but this book was easy for me to follow along and feel like I understood why current events can make people so passionate when discussing. While juggling complicated topics, this book also felt refreshing with Michelle constantly having to adhere to checklists that she promised herself to keep up with as a young girl in order to get by. Wives of Presidents are just like us! An example is always having Malia and Sasha in bed by 8 PM as young children regardless of hectic work schedules and their father traveling across country. Whatever works to keep one in a position of stability – use it! It felt good and hopeful to read about a woman who has to work, every single day, to be the person she is. It wasn’t handed to her and she did it on her own. She managed to be a Mary Tyler Moore worker bee and a mother like her own that polished the window panes every day. I worry some people will not pick this book up because they worry they are don’t share the same political views so they won’t appreciate the message. I can ensure the reader that this memoir is more about floating when you feel like drowning, smiling when you feel like frowning, and getting up every day because we are able to and alive.